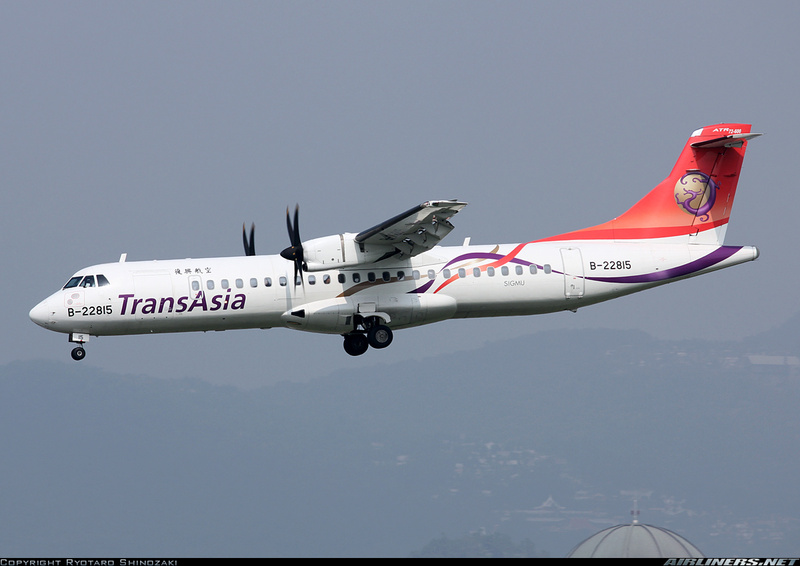 Welcome to my Trip Report on TransAsia ATR-72-600 Joyride Report! Wishing all readers, a Merry 2015 Christmas!! I have previously flown with this airline which used to operate to Singapore, on the airline's flagship - the Airbus A330-300. I am very fortunately to have done so because a few months later the airline cancelled the route as it was making losses. So since I have flown on the airline's international route, it makes sense for me to try out its domestic flights. 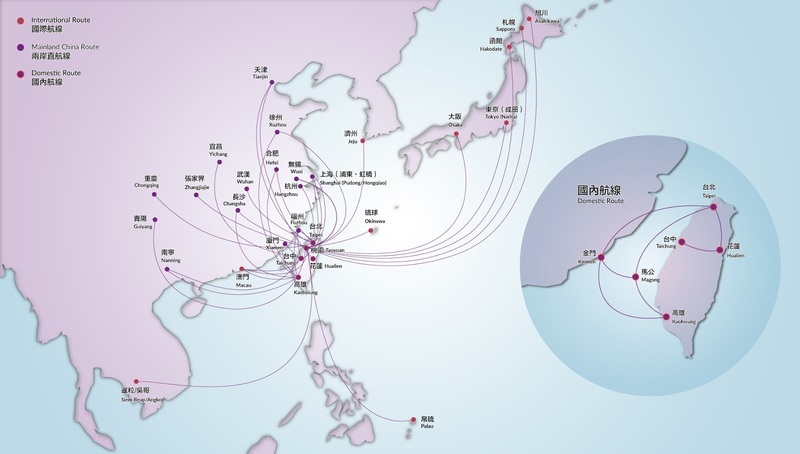 Currently, the ATR-72 aircraft is doing most of the domestic flights with the airline's Airbus A320 doing the popular route - Songshan to Kinmen flight and along with the A321 and A330 aircraft - flies on the international routes. 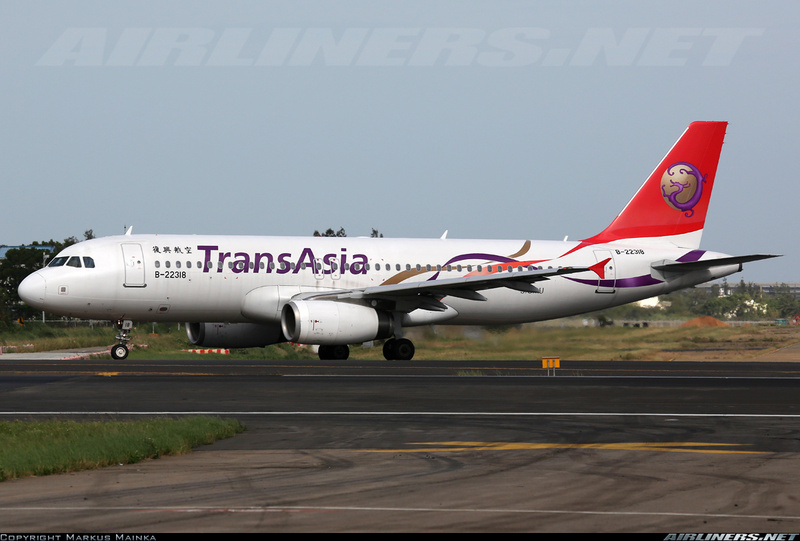 Transasia is based in Neihu district, Taipei set up in May 1951 and was the first private passenger airliner, flying Taipei-Hualien-Taitung-Kaohsiung route. However 7 years later, it ceased air services as the company concentrated on other businesses. In 1988, the company made a come back to air travel, and 3 years later, an ATR-72-500 series aircraft joined the fleet starting unscheduled charter flights to nearby international places. Airbus A320 and A321 joined the fleet later on and even an order of Airbus A380 was considered to fly to U.S but that didn't happen. 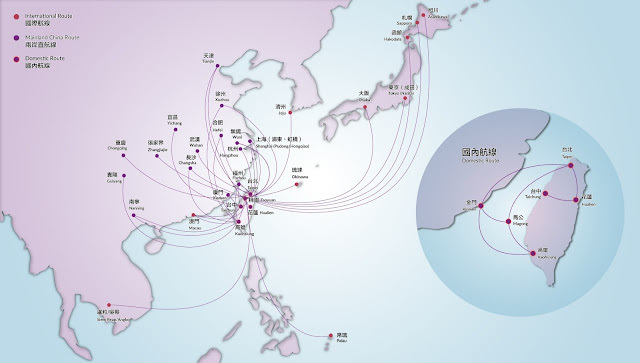 Another significant event for this airline is the setting up for its subsidiary Low Cost Carrier, V Air which took took place in January 2014 and took off near the end of the year. You can check out my trip reports on V Air over here. The airline has placed an order for 12 Airbus A321NEO (New Engine Options) and 4 Airbus A330-800 NEO to replace its current fleet. I like the new version of the airline's website, its certainly user-friendly and more importantly, smooth booking process. Usual trip to the airport took less than half an hour including the train transfer at Zhong Xiao Fu Xin Station and I was at the airport to mark this day which I have finally flown all current carriers, I needed Transasia's boarding pass to complete my set. Checking my flight, glad to know there was no delay. 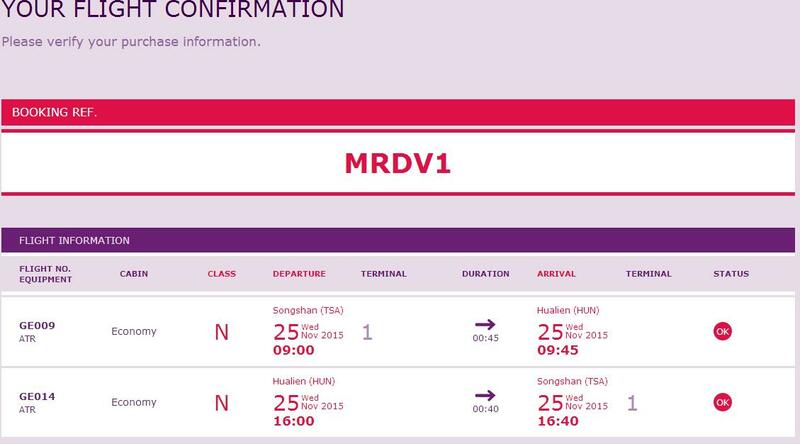 There was an extra flight by Mandarin Airlines to Kinmen - AE1267. 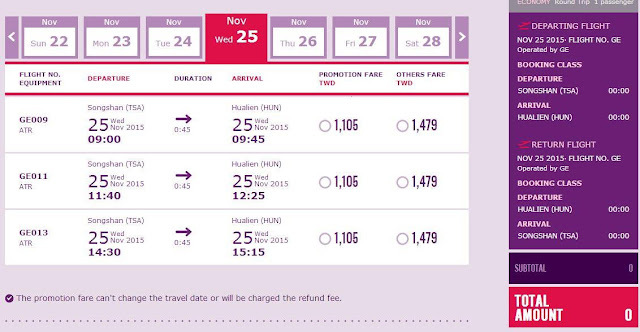 When demand meets, airline can apply for extra flights on domestic routes. For the first time at Taipei Songshan airport, I used the TransAsia counter. Air tickets for these flights (below) were still on sale. 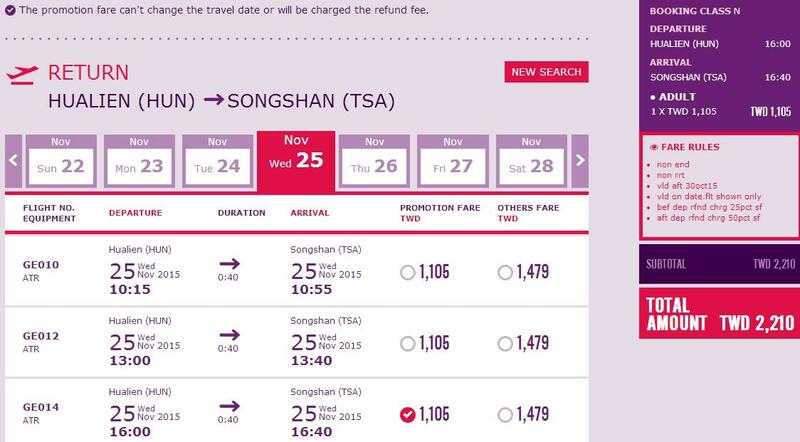 You can purchase the tickets at the airport depending on availability but buying from the airline's website would be cheaper. Got my boarding pass and I was given 17A, the same seat number I got for my Uni Air's ATR-72 trip. For ticketing enquiries, you can come to this counter. Relaxing over here with the Free Wifi and Air Condition. It's not a surprise to see some folks sleeping and missing the flight as a result! Once the time was closer, I made my way to the air side and waited for bounding announcement. We boarded the airport bus which took us near the hangers where 2 ATR-72-600s were parked, one was B-22822 and the other was B-22815. I was naturally happy to have gotten the newest ATR in the airline's fleet at that time, however I couldn't take photos of the aircraft as it was surrounded by a lot of ground crew. Boarded the aircraft at the rear door, and was greeted by the friendly young crew waiting for us. Just like my previous flight, the seat beside mine was occupied while the middle section of the aircraft remain vacant due to weight balancing issue. Here are some photos of the cabin, unfortunately I couldn't take a lot of photos due to the number of passengers walking past making it difficult to snap the cabin shot. More photos of the interior on my return flight. I have to admit this set of crew was quite good looking but not just that, they were pretty good too. 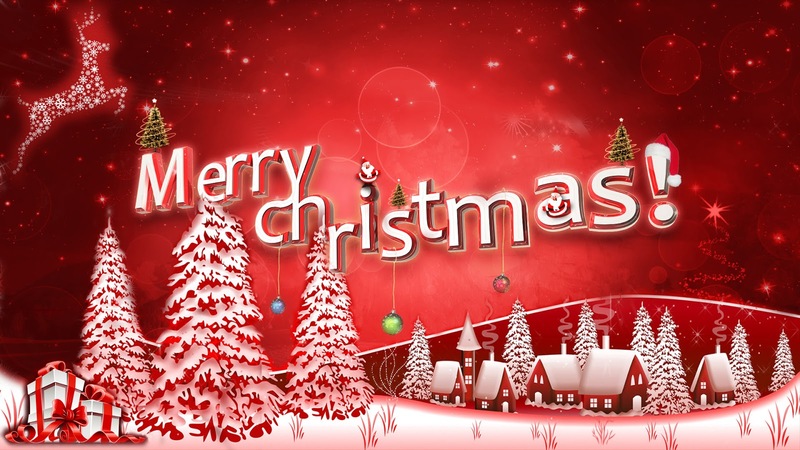 They were cordial towards everyone of us and thoughtful. For example: While they were clearing up the empty packet drinks and other rubbish, I drank as fast as I could to finish it. Instead, the cabin crew told me not to hurry and she would come and collect it later. The Air France crew on my flight earlier this year can learn a thing or two from this 2 stewardess. Announcement was made in both English and Chinese, and the English was pretty good. Among my Taiwanese flights so far, I like this set of crew the most. Once engines were started, we taxied to runway 10 for departure, taxi took a bit longer than usual. At this point, I have to admit I was a little nervous about the take off but everything went well, we lifted off effortless by the 2 powerful PW127M engines and made our very quick flight to Hualien, my first trip there. This flight also breaks my record for the shortest commercial flight in my flight logbook. Just 35 minutes of flying announced by the crew and we were soon on the ground. Weather condition was fair with some turbulence especially landing at our destination, but nothing bad. On the return flight, it was a different story. Quite a number of items at the seat pocket! What was served on this short flight? A choice of Apple Juice or Green Tea. Pushed back began with one of the engines already running. Once engines were started, we were on our way. Soon we were at the threshold, we entered the runway and took off. I prefer flying turboprops in sunny weather. I should have asked for the right side since I flew on this side before with Uni Air. Soon, we were out of it and the cruising part was smooth. Other passengers were taking photos as well, but one of them didn't bother to switch the phone to silent mode and you can imagine the "clicking" sound kept going off. It was annoying to say the least! First time in Hualien for me, usually travellers would use the train to get there. 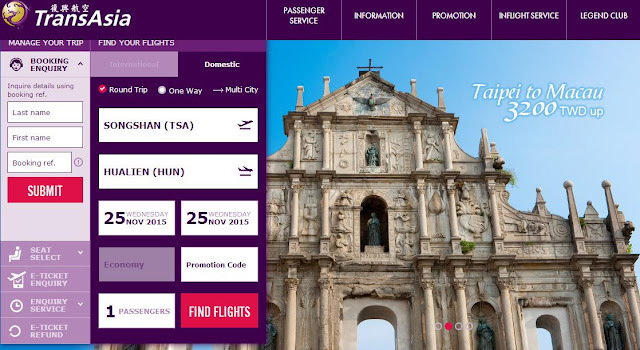 It takes around 2 hours from Taipei Main Station to Hualien. Touched down was a bit hard! No more photos from this point as the crew had highlighted that photography or video taking was prohibited since this airport is also a military base. 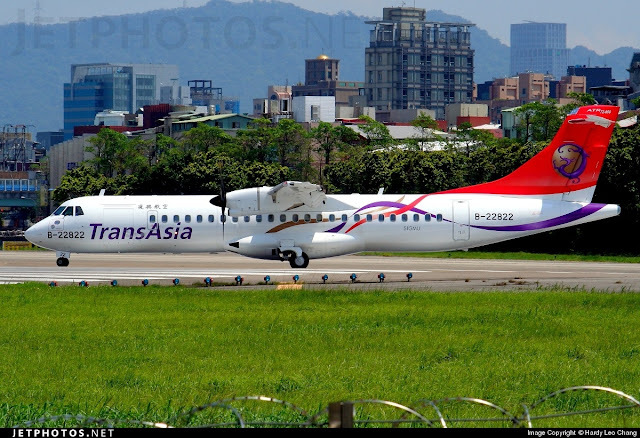 One of TransAsia's recent problems is trying to gain back the public's confidence in flying with the airline especially on the domestic route with the ATR-72. The safety record of the airline hasn't been good recently and the airline currently is trying its best to make things rights. 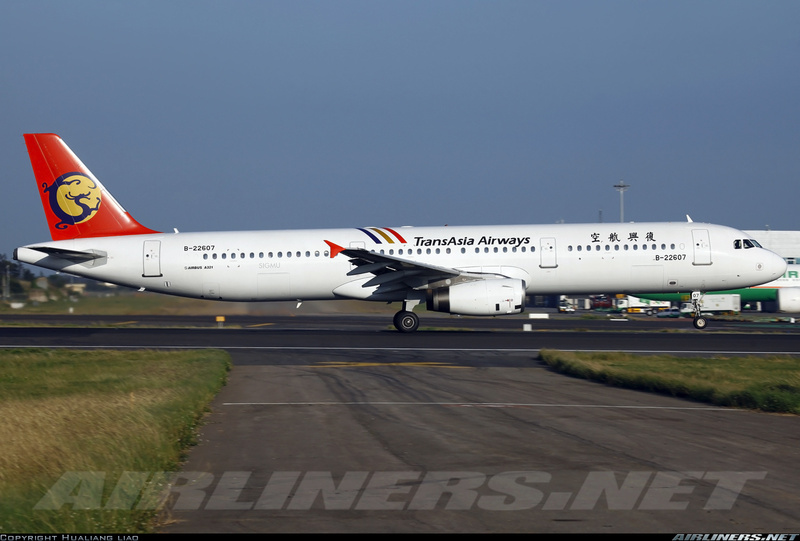 Ever since after the last crash, changes have been make and not to worry, the Taiwanese Aviation authorities are keeping an eyes on things, and so far things have been back to normal. After flying on this flight, I was impressed with the cabin interior and the cabin crew, with good service and seats. I will give an overview report in my part 2, click here for the trip report. Hope you enjoy this trip report!